The Quart coat is a short, double breasted, fitted coat with a high stand-up collar, inseam pockets, long sleeves with zipped cuffs. 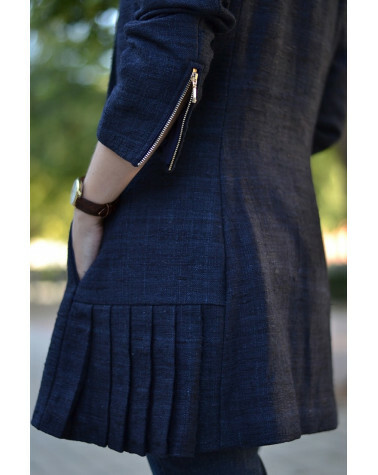 Inspired by the military outerwear, you will also find epaulettes and a pleated skirt detail at the side. The Quart coat is fully lined. - Medium weight fabric such as wool coating, tweed, gabardine, flannel, twill... (just make sure the fabric holds pleats easily). - Thread, two 12 cm (5") metallic zippers, 10 buttons (+ optional 1 small interior button), shoulder pads, sleeve heads. I'm wearing a size 36 and I measure 1,55 m (5 ft 1). Pauline alice patterns are designed for a B cup bust and an average height of 1,65 m (5 ft 5). Check our flickr page for more finished versions. 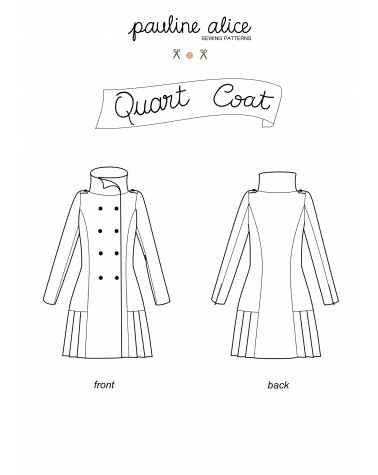 Follow the step-by-step photo tutorial of the Quart coat on the blog.